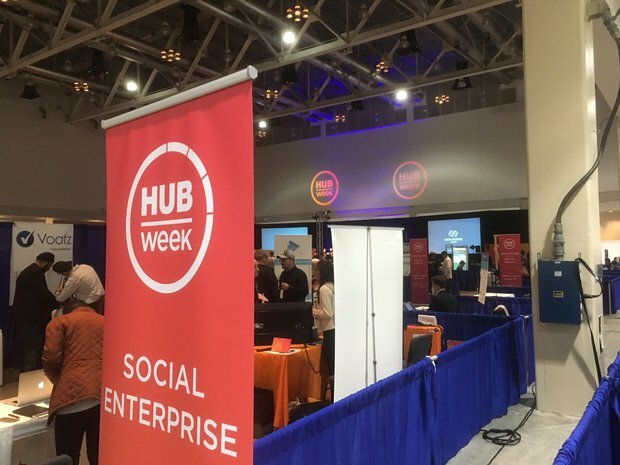 That was the ice-breaker laid on me by Pilot Analytics CEO and Founder Alan Xie as he caught me spying his start-up's space at last week's HUBweek Demo Day event in Boston, trying to figure out what the heck the company did. 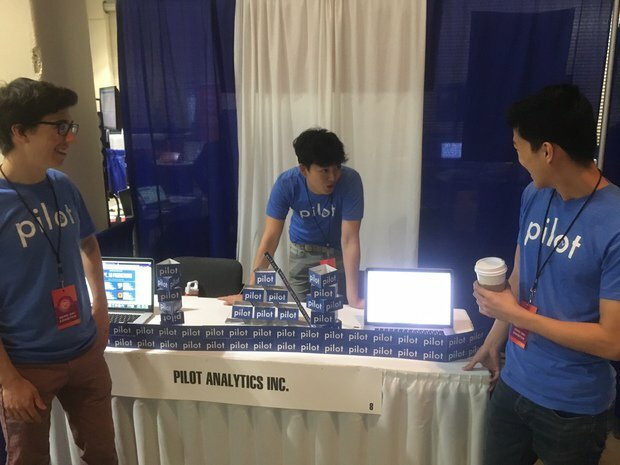 Being on a shoestring budget, the recent Harvard University grad and his colleagues decided to forego a more elaborate booth set-up, instead relying a a couple of laptops, some basic branding in the form of cardboard cutouts and their story. This outfit has a system for crunching numbers to help movie studios better gauge how much they might make on a movie, no matter how awful it sounds. Factors such as genre, cast and geographical viewing markets all play roles, of course. Interacting with start-ups minus the overbearing marketing hype is what really makes events like this attractive. With innovative ideas oozing from those affiliated with Harvard, MIT, Babson and other nearby schools, the enthusiasm of founders is marketing enough in my book. Standing behind a barebones table, Harvard alum Daniel Nevius of Analytical Space said he was hopeful that the young company he co-founded will win a chunk of the $1.5M in zero-equity awards being doled out in early November by start-up accelerator MassChallenge. Analytical Space, which has developed hybrid RF-laser data relays designed to increase information throughput for satellite operators, is one of more than 100 finalists in the competition. As I chatted with Nevius, he pondered what vertical markets -- beyond financial -- would be most keen to greatly reduce the latency of data communications. Beyond the exhibition floor, a competition among startups at Demo Day to win $10K in cash forced entrepreneurs to get their points across efficiently, giving them time to briefly introduce themselves and answer a few questions (Why should customers be loyal to you? What would you do with $1M? Who is your dream business partner?). Among those taking part was Suelin Chen, an MIT Ph.D., and CEO/co-founder of Cake, a business that encourages you to put your end-of-life requests into the cloud via a free app. "Every single one of us is going to die one day, and when that happens, will all of your loved ones know all the things you want them to know?" Chen asked to start her pitch (see her presentation, and that of smart fitness wearable company Humon, in the Facebook Live video below...apologies for poor lighting). 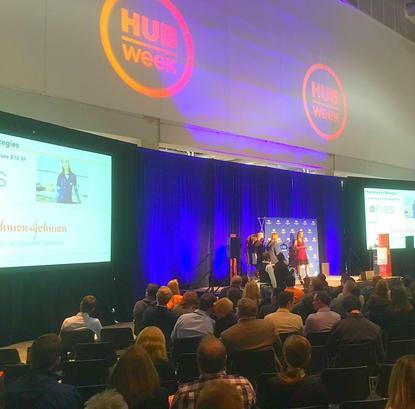 While Cake, Analytical Space and Pilot Analytics are green startups, HUBweek also showcased slightly older businesses, including Julia Computing, which has been around since 2013 to commercialize and support the high-performance Julia programming language that came out of MIT. Julia Computing touts its namesake open-source programming language as combining the "productivity of R, Python, and Matlab with the performance of C and Fortran," and company founder Alan Edelman and a compatriot at the Demo Day booth swore to me Julia was easy to learn as they ran through a demo (seriously overestimating my coding experience). It's being used in academia, as well as by engineering, finance and other businesses, and the programming language even has its own annual confab called JuliaCon. This isn't really about a tech startup, but one of the more remarkable stories of the day was Mighty Well's winning of the $250K Babson Breakaway Challenge for women-run businesses. Mighty Well is led by recent Babson College grad Emily Levy, who was inspired to start her medical fashion business after being diagnosed four years ago with Chronic Neurological Lyme Disease and finding herself wanting to hide her less-than-attractive PICC line with something other than the cut-off sock that had been suggested by her doctor. She described Mighty Well's offerings as helping "patients to look and feel their best while going through their difficult medical time." Demo Day kicked off with a focus on women entrepreneurs, and GE Ventures' Sue Siegel gave a talk during which she urged women to stand up for themselves in the workplace, doing so for themselves, each other and society. She encouraged all of the women in the room to offer their mentoring services, regardless of what professional title they might have in front of their name. "Looking out for others is a habit worth acquiring," she said. But she acknowledged "no matter how hard we work, this problem isn't going to go away as quickly as we want." She pointed to one of her biggest personal and professional regrets, when she worked right up until her water broke when pregnant with her first son, and then headed back to work after just a couple of days of maternity leave even though her company offered leave. She realized later that her behavior set a poor example for other men and women in the office, who should have been encouraged to take time for themselves and their families. Siegel emphasized that gender equality in the workplace "isn't just a women's issue," in that society benefits by having all of the smartest brains put to work. "We have to educate and empower men to be our allies in this cause because my bet is that many, if not most, of our male colleagues are totally willing to be our allies if we let them."